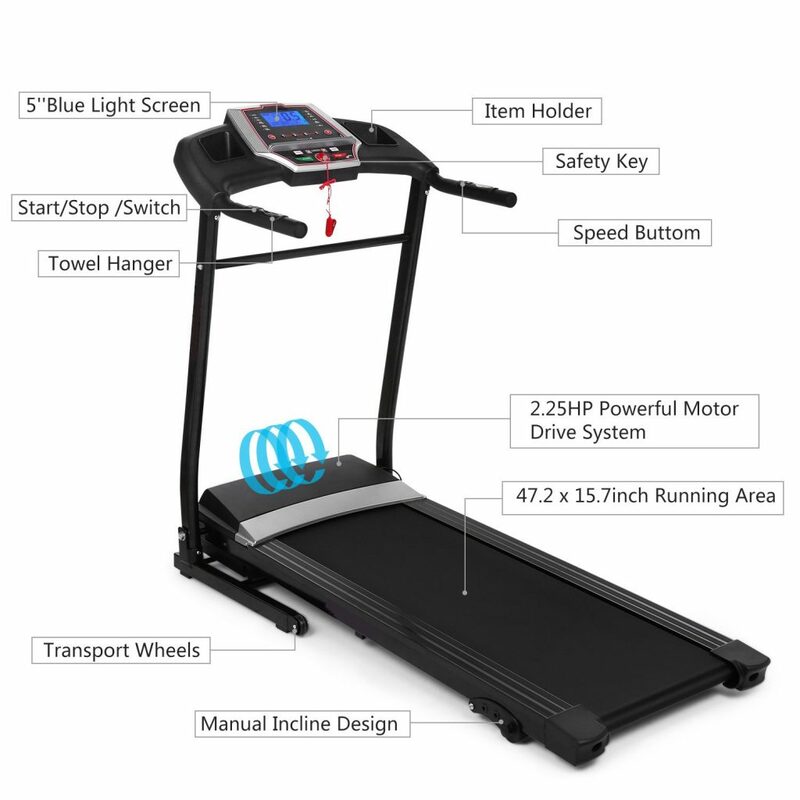 Flyerstoy Folding Electric Fitness Treadmill is a decent quality motorized fitness equipment with a 2.25 horse power motor drive system for walking, jogging and running in the comfort of your home. This is a very recent, hot new release product at Amazon.com without any customer reviews or ratings online yet. You can get the expert assembly with your purchase at an extra 72 dollars at the time of this review. It comes with a variety of user-friendly features like the smartphone app control. It runs smoothly and quietly (low noise motor) without disturbing your music or video, people sleeping in your house or your neighbors downstairs. You have the item holders on both sides of the 5-inch blue light display where you can put your smartphone, keys, MP3 player or other smaller items. Start/Stop, Speed plus and minus are located on both handles for your easy access during your workout. There is a convenient towel hanger just below the console. 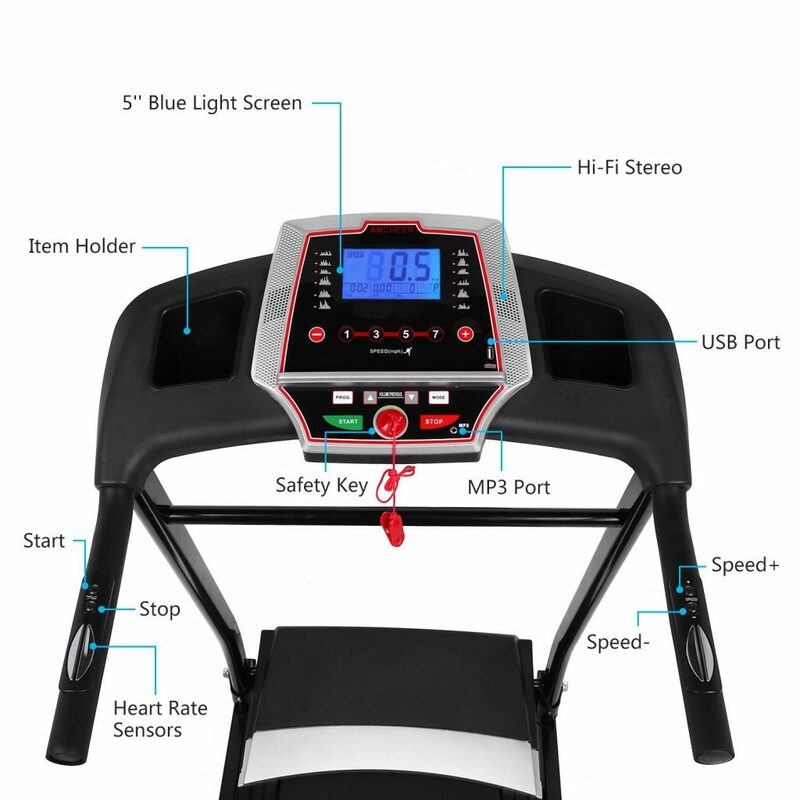 The red safety key is common to all treadmills and you’ll find it on this one too. The treadmill stops quickly in case of an emergency. The running belt measures 47.2 x 15.7 inches and is a bit wider than the compact treadmills we reviewed so far and should be enough for most adults. It has three incline levels that you can adjust manually for more challenge and burning more calories. The incline is not automatic and can’t be adjusted via the display panel. You can control the treadmill via the FitShow Sports app that can be downloaded on both iOS and Android phones- available on Google Play and Apple App Store. You can also get your personal training and health report. You can jog or run at speeds between 0.8 and 12 km per hour thanks to the powerful 2.25HP motor drive system. There are 12 preset training modes you can choose from, that are designed to help you burn calories more efficiently or to achieve different goals with varying levels of speed and time settings. You can also customize your own program by choosing your own speed and manual incline level depending on your physical condition or what you can handle at the time. It is a good idea to increase and decrease the speed during your session, as you go along to be able to burn more fat and calories in a shorter amount of time. Please also keep an eye on your heart rate and try and stay in the zone as the elevated heart rate means more calories burned. It has a convenient foldable design with the hydraulic pressure soft drop system and the built-in transport wheels at the front to be moved easily within your house. It has a compact space saving design and measures 59.1 x 45.7 x 26.0 inches as assembled and 55.1 x 25.6 x 20.9 inches as folded. The maximum user weight capacity is specified as 265 pounds by the manufacturer. You can use this treadmill every day for a great cardio or interval training, burn calories or increase your endurance. You will keep fit if you jog on it regularly and eat generally healthy.